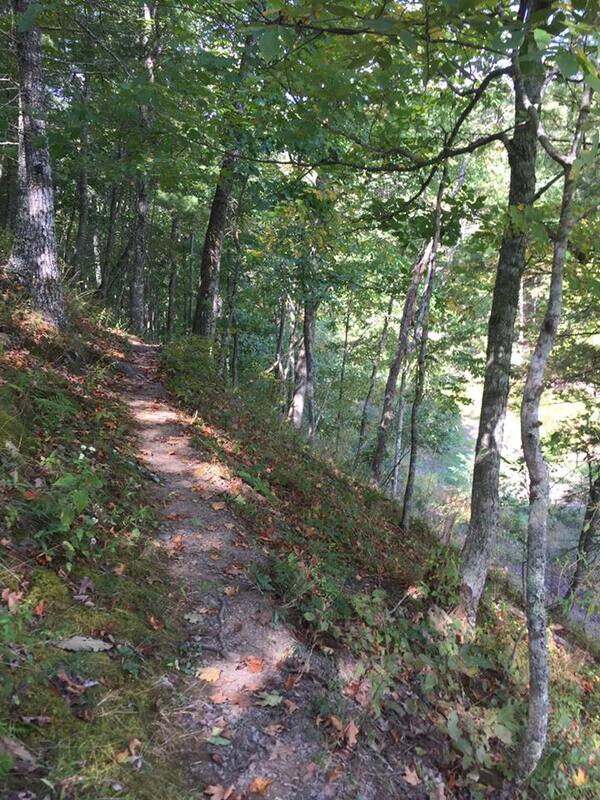 The Greenwood Point Trail is located nearly on the West Virginia border, along Lake Moomaw, north of Interstate 64 and south of Virginia Route 39. The best access from Charlottesville is to go west of Staunton to Rt 42, take that to Rt 39 in Goshen, and take 39 almost to West Virginia before turning south on Rt. 600 to the Bolar Mountain Campground, location of the trailhead. The drive is about 2 and a half hours from Charlottesville. See the map at the end of this posting. 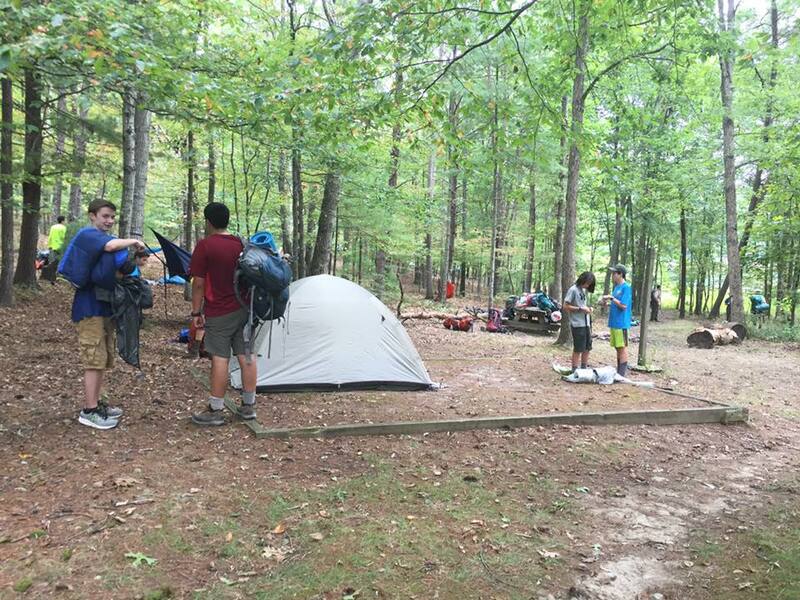 I took my scout troop out here in mid-September for a backpacking trip, sight unseen. 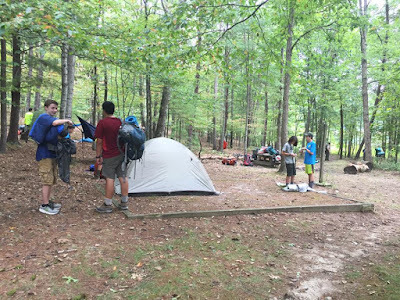 It was an ideal location for the troop, as the hike was about 3.5 miles each way, with some fairly strenuous parts and some nice views, and a large lake near the campsite. The hardest thing about the hike was figuring out where to pay for our campsite! Because we camped in mid-September, we went out of season. Two of the three campgrounds were closed for the season, and it was difficult to figure out how to get vehicle passes to leave in our cars. What you have to do is drive to the marina, which is still open, and pay for the passes there. The cost was incredibly low! It cost us a total of $8 for the troop to camp at Greenwood Point, and to obtain six vehicle passes. We parked next to Bolar Campground #3, at a turnaround area just a few sites away from the trailhead. Although there is less than a 400 foot elevation gain between the low and high points on this trail, it is a surprisingly tough trail. This is because most of the elevation gain and loss is right in the middle of the route. On the way out to the campsite, you climb up to a vista, then drop steeply to a dry creek crossing before ascending briefly but very steeply again. The trip doesn't seem as steep on the return. It was very easy to follow the entire way and was not at all overgrown. As you come to the Greenwood Point Campground, you leave the woods and come out into an open area. The first thing you cross is an old macadam road, which predates the lake. This map shows two editions of the USGS Topo - one before the lake and one after. The campsite is just below the former Perkins Point landmark. As you can see, a road went through the area prior to the lake filling in. There are some old signposts, then several campsites scattered around the area. One is near the water to the left. Two are to the right where the woods and the field meet. And one is far to the right on the lake shore. When we arrived, both lakeside campsites were taken, but the interior sites were bigger and worked better for our group. Our campsite was in the trees, just south of a small open field. The lake was low, but I am not sure whether this is due to dry conditions or officials draining off part of the lake at the end of the season - or both. The boys enjoyed the fishing at the lake though the group did not catch many fish. One boy who did catch a fish reported doing so using a large lure he found at the site. Fishing and dropping rocks into the lake kept the scouts entertained, and most reported liking this campout better than the backpacking campouts on the Appalachian Trail, our usual destination. There were also a couple of old privies near our campsite. called them "dark," but they still beat digging a hole. This shows another campsite closer to the beach on the north end of the field. This was our "beach" on the northern end of the peninsula, right where the road would have submerged into the lake. Morning shot from the beach looking northeast. Autumn starts to encroach on the trail in mid-September. Adult leaders bring up the rear when backpacking. Group shot of the scouts. First, I've been reading for a few years and think your site is easily the best online source for VA trail info. Maybe a book in the future? Second, a question. Do you have any information about the Panther Falls trail that shows up as trail #508 on the Nat Geo map? I enjoy running in that area and wanted to use the trail to connect FS Rd 315 and FS Rd 39. Today, I drove out FS Rd 39 and looked for the trail. After a little searching I found an old road bed with a faded blue blaze about where it is listed on the map. However, it didn't look like it had seen traffic in a while. I hiked down for five min or so. It didn't look any better, and no more blazes. I've tried to find more info about that trail online, but everything I've seen only talks about the main Falls trail off of 315. I'll head back out there at some point to see if it really is the trail. After looking at satellite images I can't tell if the trail is in the right location. Does the trail show up in any of your old resources? Thanks for any help you can offer. You really have assembled a great thing here for those who are interested in VA hiking. Thanks for the recommendations. I was unaware of the historical maps webpage. Great information.